Che loves her, but he knows that there is something seriously wrong with his 10-year-old sister Rosa. When Che and his family move from Thailand to New York City for his parent’s work, there is quite a culture change, and Che feels more home-sick for Sydney and his friends than ever. Having moved from country to country since he was twelve, he yearns for stability and a place to settle down. The only thing that has stayed constant is his love for boxing and his strict training regime, which he maintains daily at whichever gym he joins. When he meets Sojourner, a beautiful and talented fellow boxer, Che can’t help but fall for her, and soon his life in New York doesn’t seem as bad. He also makes friends with the daughters of his parent’s best friends (and the ones who are funding their stay)- the McBrunights. Unfortunately, Rosa also takes a shine to the wealthy McBrunights- one of the twins, Seimone, in particular. She soon ‘adopts’ her as her best friend, and before long, the two of them are as inseparable as Seimone and her twin Maya once were, leaving Maya off on the sidelines. Che knows it’s only a matter of time before something goes wrong, and when the inevitable happens, he finds himself struggling to cope with the repercussions, and the knowledge that comes with them. Will Che be able to convince his parents (and the outside world) that Rosa is not as she seems? Or will his psychopathic little sister continue to fool all of those around her until she can achieve her means to an end? This is a unique and unusual novel that keeps you guessing. While reading it, you can’t help but wonder how you would cope if you were placed in Che’s situation, and had to deal with the psychological mind games that his genius but disturbing little sister plays. None of the characters in this novel are two-dimensional- all have a role to play and the ways that they interact with Rosa set a path for how the story will play out at the end. 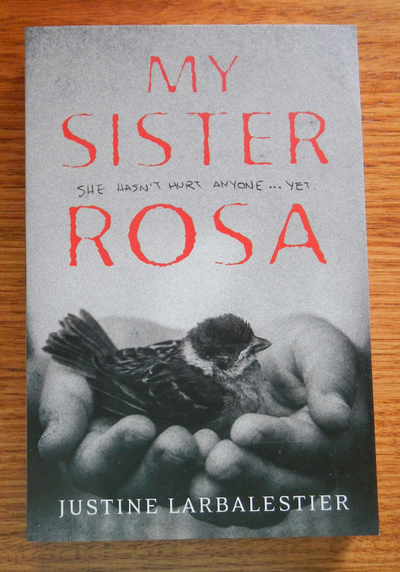 Cleverly written, My Sister Rosa is a riveting and surprising thriller that you won’t want to put down.